A pretty good guitar that's actually a beast! Great looks, superb playability, rock-solid tuning and a proper padded gigbag. What's not to love? There was a time when Paul Reed Smith guitars were seen by some as elitist playthings - too expensive for the working guitarist, and too pretty to risk pranging at a gig. These were the guitars you bought when you'd bought all the golf clubs and swanky German sports cars you could need - 'Guitars for lawyers and doctors' went the rather unkind mantra. In 2001, PRS began to change those preconceptions with the launch of the Korean-made SE models. Keenly priced for the average guitarist and styled to look like their American-built siblings, the SE range has evolved a lot over the past 15 years. The 2017 models are easily the best-looking and highest-spec SE guitars yet. Let's see what they've got cooking. Slipping it from its padded gigbag, no-one could deny our 2017 SE 'Floyd' Custom 24 is a looker. 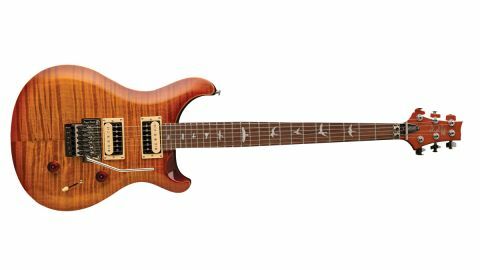 In typical PRS style, this guitar's pretty flame maple top is like a tractor beam to the eyeballs. Underneath the eye candy, you'll find a mahogany body cut in PRS's classic double-cutaway shape. Slipping it from its padded gigbag, no-one could deny our 2017 SE 'Floyd' Custom 24 is a looker. The supremely comfortable Wide Thin profile neck is honed in maple, and comes paired with a rosewood 'board with a flock of the now-iconic bird inlays and plays host to 24 fat frets. So what makes the 2017 SEs better than the previous editions? Well, you get the same 'signature' PRS headstock logo as the USA models instead of the block logo truss-rod cover - with a much subtler 'SE' logo, too. But the big news is a pair of upgraded pickups. Switch to single-coil mode and you're almost in Hendrix Little Wing territory, with little wobbles on the whammy bar adding to the effect. The 85/15 set is based on Paul Reed Smith's 1985 Standard Treble and Bass pickups, much-respected for the ability to offer great humbucking and single-coil tones. These new humbuckers are wired through a master volume, master tone (with a built-in push/pull coil split) and a three-way pickup selector blade switch offering both pickups solo and combined. Textbook stuff. Time to plug in. Running through our amp's clean channel, the bridge 'bucker unloads a whole sackful of sparkle. While this setting works great for choppy rhythm stuff, we prefer adding the neck pickup into the mix. This combination retains the bright clarity of the bridge pickup but adds some warmth. Switch to single-coil mode and you're almost in Hendrix Little Wing territory, with little wobbles on the whammy bar adding to the effect. You don't always have to divebomb on a Floyd, y'know! While many associate PRS guitars with blues-rock cats such as Carlos Santana, card-carrying members of the metal brigade including Mark Tremonti, Chris Robertson of Black Stone Cherry and Periphery's Mark Holcomb are all in PRS's signature artists, too. With that in mind, it makes sense that the new Custom 24 'Floyd' has been voiced with heavy in mind, and the 85/15 pickups have less lower-mids than regular PRS humbuckers, and that means more clarity even when you get a bit crazy with the saturation. Interacting with varying levels of dirt, the bridge humbucker can pull off anything from vintage AC/DC to scooped-mid thrash stuff. We like the clarity and note separation across all three locations on the pickup selector switch. Blues players will love the smooth attack and sustain of the neck position, and the single-coil tones on tap. This is a seriously versatile guitar. We already respected the SE Custom 24 and its versatile tonal palette, but the newly spec'd 85/15 pickups make this latest model a far more interesting prospect for metal players. Every note propels itself off this guitar like a firework. The fact the guitar is so damn pretty makes us powerless to resist its charms.